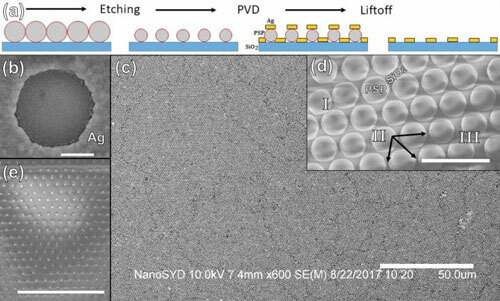 (Nanowerk News) Researchers have demonstrated large-scale fabrication of a new type of transparent conductive electrode film based on nanopatterned silver. Smartphone touch screens and flat panel televisions use transparent electrodes to detect touch and to quickly switch the color of each pixel. Because silver is less brittle and more chemically resistant than materials currently used to make these electrodes, the new films could offer a high-performance and long-lasting option for use with flexible screens and electronics. The silver-based films could also enable flexible solar cells for installation on windows, roofs and even personal devices. 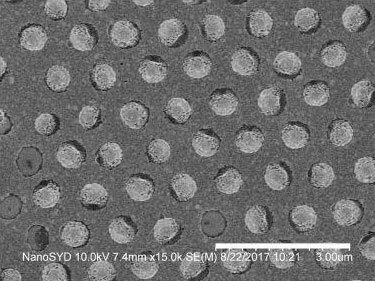 In the journal Optical Materials Express ("Transparent and conductive electrodes by large-scale nano-structuring of noble metal thin-films"), the researchers report fabrication of a transparent conducting thin-film on glass discs 10 centimeters in diameter. 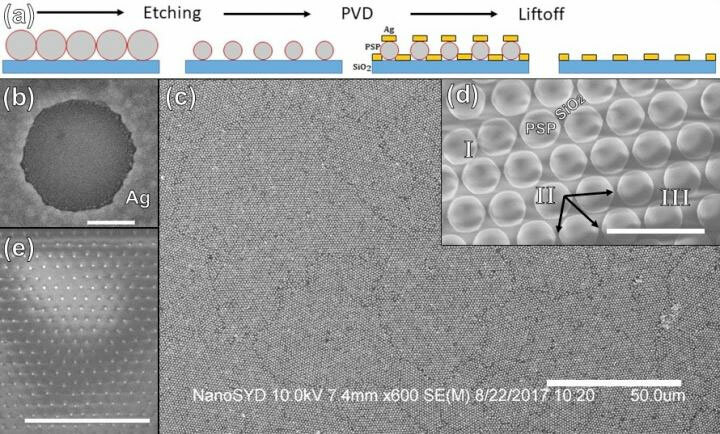 Based on theoretical estimations that matched closely with experimental measurements, they calculate that the thin-film electrodes could perform significantly better than those used for existing flexible displays and touch screens. "The approach we used for fabrication is highly reproducible and creates a chemically stable configuration with a tunable tradeoff between transparency and conductive properties," said the paper's first author, Jes Linnet from the University of Southern Denmark. "This means that if a device needs higher transparency but less conductivity, the film can be made to accommodate by changing the thickness of the film." Most of today's transparent electrodes are made of indium tin oxide (ITO), which can exhibit up to 92 percent transparency -- comparable to glass. Although highly transparent, ITO thin films must be processed carefully to achieve reproducible performance and are too brittle to use with flexible electronics or displays. Researchers are seeking alternatives to ITO because of these drawbacks. The anti-corrosive nature of noble metals such as gold, silver and platinum makes them promising ITO alternatives for creating long-lasting, chemically resistant electrodes that could be used with flexible substrates. However, until now, noble metal transparent conductive films have suffered from high surface roughness, which can degrade performance because the interface between the film and other layers isn't flat. Transparent conductive films can also be made using carbon nanotubes, but these films don't currently exhibit high enough conductance for all applications and tend to also suffer from surface roughness due to the nanotubes stacking on top of each other. 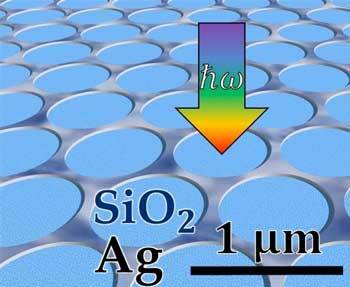 The researchers demonstrated that their large-scale fabrication method can be used to create silver transparent electrodes with as much as 80 percent transmittance while keeping electrical sheet resistance below 10 ohms per square - about a tenth of what has been reported for carbon-nanotube-based films with the equivalent transparency. The lower the electrical resistance, the better the electrodes are at conducting an electrical charge. "The most novel aspect of our work is that we accounted for both the transmission properties and the conductance properties of this thin film using theoretical analysis that correlated well with measured results," said Linnet. "Fabrication problems typically make it hard to get the best theoretical performance from a new material. We decided to report what we encountered experimentally and postulate remedies so that this information could be used in the future to avoid or minimize problems that may affect performance."